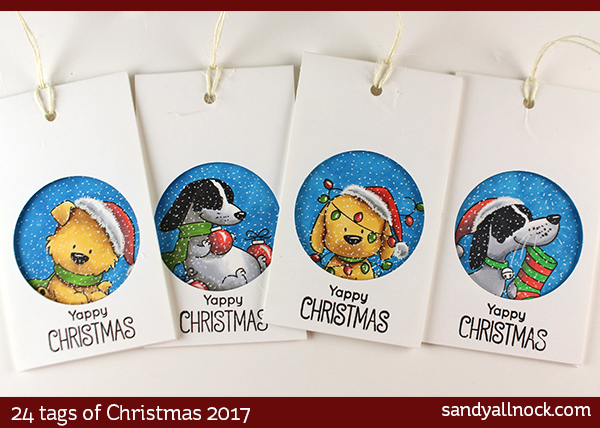 Let the tradition unfold: my tags series every year is always fun, and gives me a chance to feature some favorite Christmas stamps and some coloring techniques – some are FAST ones to create this year, since my Christmas season promises to be jam-packed. But of course not today’s, because….puppies! The pups in the Happy Pawlidays set look just like my babies, don’t they!? The chubby bubba is my little Giallo, and the skinny minnie is lady Vienna…both colored in Copics today. Watch the video below or click HERE to see it in HD on YouTube. Christmas Bible Crafts all week too! In addition to the tags for these 6 days, I have some other crafts on my Bible Journaling channel. Today: a gift page! Give a journaling Bible and create a page for the recipient inside. View the video below or click HERE to see it on YT. You inspire me to buy my first set of copic markers. Dogs and Christmas, the best combo! And seeing these tags makes my heart sing! So cute… I like the idea of them peeping through the window. Tags are too cute! I purchased the stamps and will try to duplicate the tags. Thanks Sandy! Oh my gosh these are the cutest!!! Dogs and Christmas, two of the best things! Oh no – more dog stamps, not sure I can resist! these are so darn cute. I have to try and make a similar one..
Love the puppies . Thanks for sharing and for the chance to win one of these lovely tags. You can not help but smile when you look at these puppies! How darling! Love the hint about the white pen, too. I thought I commented on these but done see my name. Love the puppies. Also love the idea to make them ornaments. Beautiful tags! I am going to buy this stamp set, because it is gorgeous. Thank you so much for sharing this idea! I love these cute little pups! I adore these Tags! Puppies make life better and puppy tags make gifts much better! Puppy tags are great for the grandkids, boys or girls. So its a win, win. Thanks . These puppy tags are the cutest tags ever! I love that new stamp set from MFT. Your coloring is breathtaking. These are so adorable, ANYTHING with dogs on it and I am melting. I have a bulldog whois the love of my life. I just love when I see stamps or paper with dogs on it, I always grab them for when I work on her scrapbooks.